Hey! young man, my guess is you have heard from one of your friend or relative about Facebook. And you want to create a Facebook account. But you don't know how to create it. Here I would help you step by step to do so. 1. Before creating facebook account, you should have your own email address. If you have it, fantastic! If not, go to gmail.com and create a new email address by clicking Sign Up link. 3. 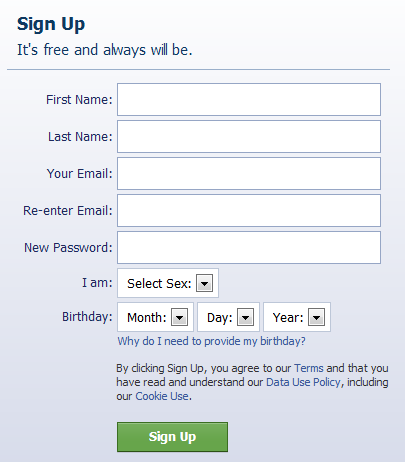 So just fill the form with asked information (name, email, password, gender, date of birth), and click Sign Up button. 4. After you submit the form (by clicking Sign Up button), Facebook company will send you an email at email address you written in form. Read that email, it would have a link (usually blue color), open that link by clicking the form. And you have finished creating the Facebook account. 5. Remember you email address and password you chosen. It would be used to login on Facebook. See, right side of top blue section. Enter email address and password there to login. facebook fan age is a great way of marketing this days, i m using this soft to provide fanpagelike & post check it out, www.facedominator.com.